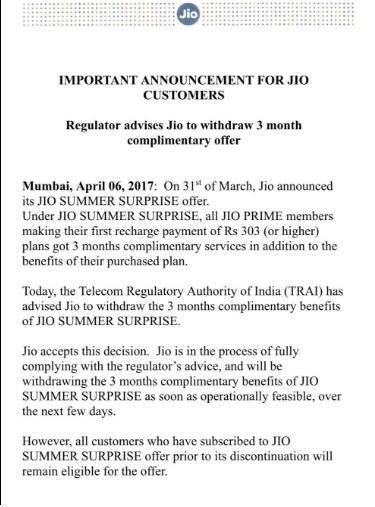 Yesterday Jio released the press release that they are forced to close the Jio summer surprise offer due to the TRAI advice and those who already subscribed will get the offer. While seeing the news everyone thought summer surprise closed and now no one can avail the summer surprise offer. But still, there is enough time to get the summer surprise offer. 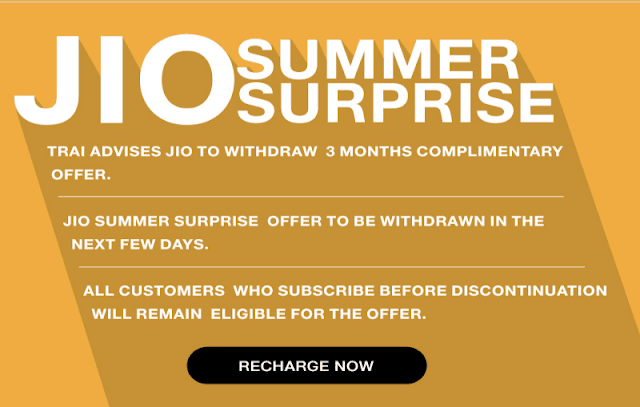 This is a great news for all jio users those who still not subscribed to jio summer surprise offer. So if you are not subscribed to jio prime or jio summer surprise offers then do recharge now. don’t wait for another moment. we can’t say when it will end. so do it asap. NOTE: MOST PROBABLY IT WILL CLOSE ON APRIL 8TH. IE, YOU HAVE ONLY 48 HOURS LEFT TO SUBSCRIBE FOR JIO SUMMER SURPRISE OFFER. THIS IS NOT CONFIRMED. Anyway the customers who already done Prime+Rs 303 [or higher recharges] will get the summer surprise offer. Many are in a confusion whether recharging today[RIGHT NOW, 6TH APRIL 2017] itself will enrol them to the Summer Surprise Offer. Some users are reporting that it is working for them but there is no guarantee for it.